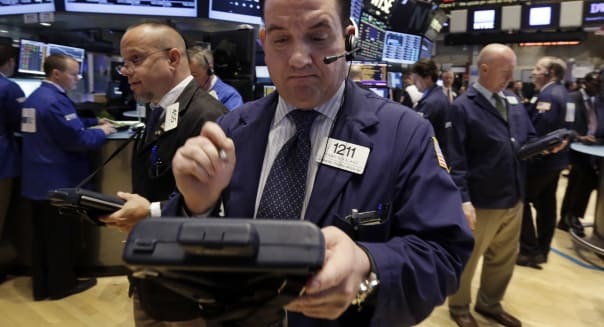 NEW YORK -- U.S. stocks ended marginally lower Wednesday after Wall Street saw little in the minutes from last month's Federal Reserve meeting to alter expectations of when the central bank will raise interest rates. Following the minutes' release, the Dow and S&P 500 pushed into record territory before giving up their gains. Officials at the Fed's April policy meeting believed it would be premature to raise interest rates in June and that a bump in inflation was being offset by a weaker labor market and softer data, according to the minutes. %VIRTUAL-pullquote-They didn't give much tangible evidence that they were going to do anything different than what the market was already prepared for...%"They didn't give much tangible evidence that they were going to do anything different than what the market was already prepared for, and I think that's why the net-net was a benign impact to financial markets," said Mark Luschini, chief investment strategist at Janney Montgomery Scott in Philadelphia. The Dow Jones industrial average (^DJI) fell 26.99 points, or 0.15 percent, to end at 18,285.4. The Standard & Poor's 500 index (^GSPC) lost 1.98 points, or nearly 0.1 percent, to 2,125.85 and the Nasdaq composite (^IXIC) added 1.71 points, or 0.03 percent, to end at 5,071.74. The Dow had closed at record highs in the previous two sessions and Wednesday was briefly on track for another all-time high close. The S&P, also near record highs, is now trading at 17 times expected earnings, compared to its 10-year median of 15. Five of the 10 major S&P 500 indexes were lower Wednesday, led down by a 0.4 percent decline in the industrials index. Southwest Airlines (LUV) pushed airline shares lower with a drop of 9.1 percent after it forecast a decline in passenger unit revenue for the quarter. The Dow transports index lost 2 percent. Among four banks fined a total of $6 billion for manipulating currency rates, Citigroup (C) lost 0.8 percent and JPMorgan (JPM) fell 0.8 percent. While the Fed is broadly expected to raise rates this year, the timing of the move has kept the market on tenterhooks. A Reuters poll Tuesday showed most economists were now less sure about when rates would be increased, but the median still suggested a move in the third quarter. Growth slowed to a crawl in the first quarter, while recent economic data has painted a mixed picture. Consumption, business spending and manufacturing data have suggested the economy is struggling, but housing starts were strong. Advancing issues outnumbered declining ones on the NYSE by 1,571 to 1,426, for a 1.10-to-1 ratio on the upside; on the Nasdaq, 1,386 issues fell and 1,369 advanced for a 1.01-to-1 ratio favoring decliners. The S&P 500 posted 32 new 52-week highs and 4 new lows; the Nasdaq composite recorded 102 new highs and 54 new lows. About 5.8 billion shares changed hands on U.S. exchanges, below the 6.3 billion average this month, according to BATS Global Markets. -With additional reporting by Tanya Agrawal, Chuck Mikolajczak and Caroline Valetkevitch. At 10 a.m., the National Association of Realtors releases existing home sales for April; the Federal Reserve Bank of Philadelphia releases its survey of manufacturing conditions in the Mid-Atlantic states; the Conference Board releases the Index of Leading Economic Indicators for May; and Freddie Mac releases weekly mortgage rates.